Penny-pinching Preds fans, we’ve got something for you. If you missed Saturday’s $10 early-bird ticket sale in favor of sleeping in, you can still snag a voucher for cheap (as in, free) Preds tickets from the comfort of your own desk chair/bed/couch/standing desk, no waiting in line required. Of course, there’s a catch or two. These tickets are only for preseason games, you’ll probably get a sales call before the tickets are in your hands, and you will eventually have to leave the comfort of your couch to go to the box office and swap your voucher for tickets. Small price to pay. 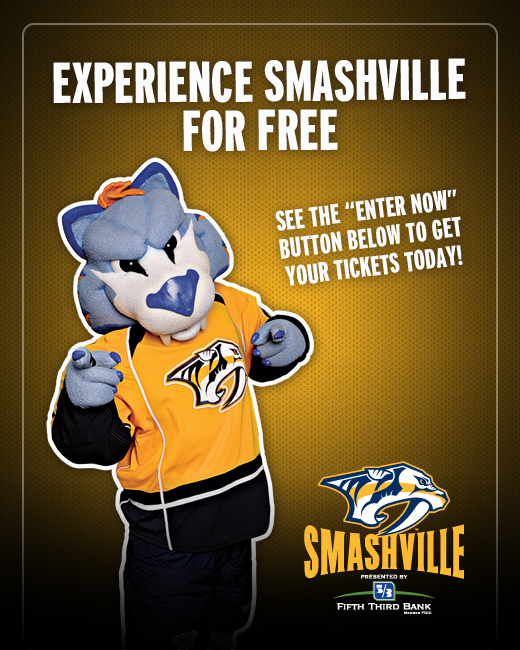 To get your voucher for free preseason tickets, just head over to the Preds’ Official Facebook page, hit “Like,” then click “Experience Smashville” in the sidebar. Fill out a quick survey, forfeit your personal details and you’ll end up with a voucher that presents you with two options – Call a sales rep, pay a $5 fee and get guaranteed tickets, or just walk your voucher down to the box office before September 23 to trade it for tickets, no fee (but no guarantee). Okay, there are a few hoops to jump through, but with regular tickets at $30 apiece (minimum), a bit of red tape acrobatics doesn’t seem so bad. Thanks to @Apparition for the tip!